The objective of this activity is to enhance your awareness of how the “point of view” changes the narrative and overall impact of the resulting image. Take a series of photographs of the one object moving the camera in all axes: Up, down, left, right, forward and back, also changing pitch and yaw. This is a really simple exercise, but at the same time, very powerful. It will give you an appreciation how many different ways one simple object can be photographed and the dramatic differences the simple act of moving the camera can have on the resulting image. Be sure to get a wide range of images, trying to cover as many angles as possible. This is one of the most powerful but simple tools in a photographer’s arsenal. After experimenting with different angles on a particular subject you will gain an appreciation for what these angles do in regards to the impact and narrative of the final image. This exercise is designed so that you start thinking about how you approach a subject depending on your intended result. If you do not already, this act of walking around and looking at objects in as many angles as possible will become second nature. Make a series of 6 jpeg exposures. Allow about 1 hour to complete this activity. After completing this activity reflect on the differences from image to image and how the different angles change the narrative of the subject and then document these thoughts (one paragraph per image) on your blog. Post these images to your blog accompanied by the relevant commentary for assessment. Please note, these images were taken in natural light on a day when the weather was constantly changing, consequently, the white balance does change a little, but as I feel this adds to the different moods, I have chosen not to equalise them in Camera Raw. 3/4 view from rear. This view has a very calm, serene feel. 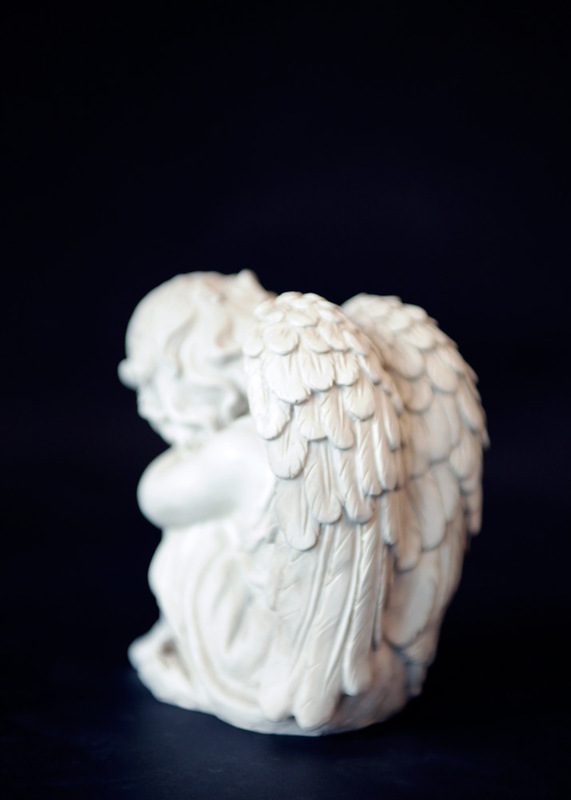 A narrow depth of field has kept focus on the texture in the wings, and softened the face, adding to this mood. 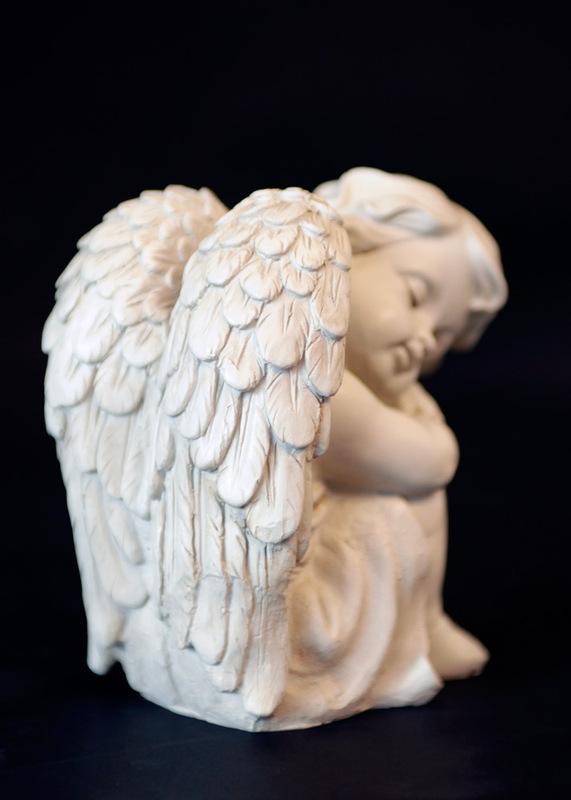 Shooting from a low angle has put the cherub’s cheek as a secondary focal point. 3/4 view, front facing. Turning the subject 90 degrees has resulted in a lot more light reaching the face, with the wings being in shadow as well as slightly softer in focus. Here the main texture focus is on the hair and the mood is a little more dramatic, with this view giving a sense of catching a napping cherub unawares. 3/4 view from above, tilted angle. 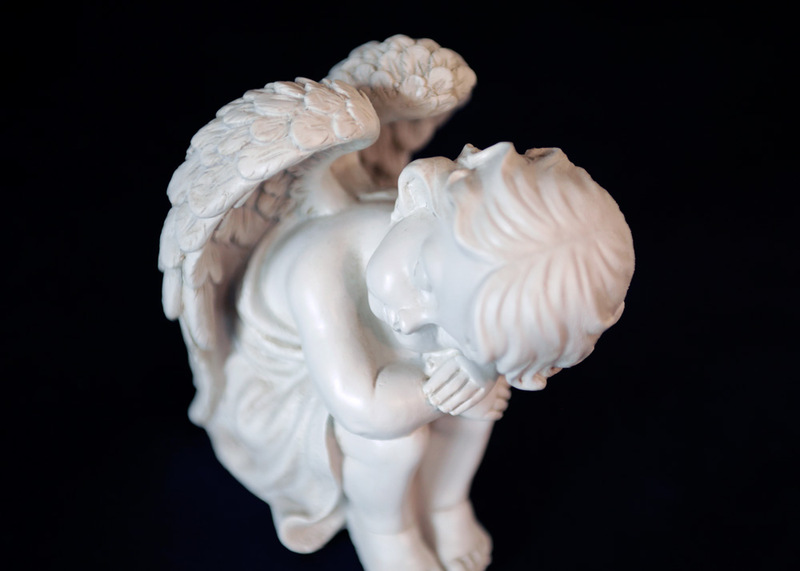 The light in this view enables a lot more detail to be placed on the cherub as a whole, the wings, while in focus, are noticeably darker due to the angle of light reflecting from them. 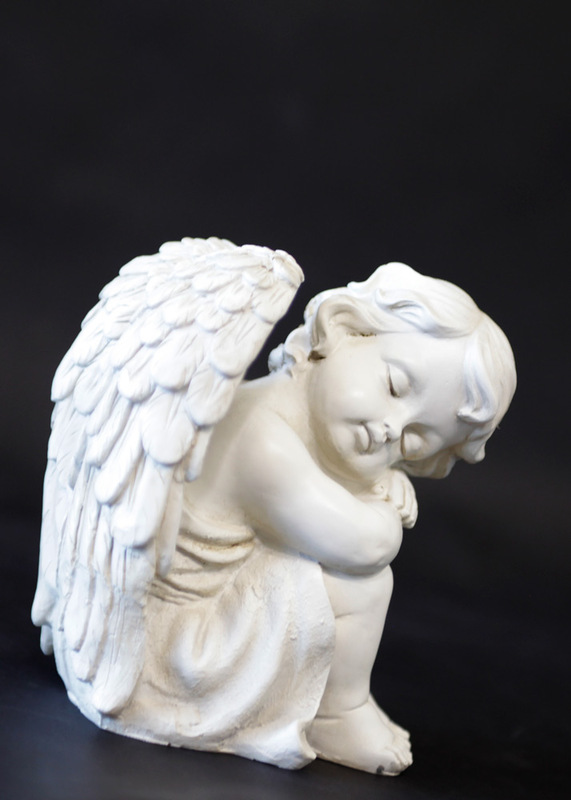 I feel this creates a more uplifting image, in that it gives a sense of energy, as if the cherub is about to wake up. Image 4 – side view. This is the only view in which the entire face is visible, and it easily draws the eye of the viewer. 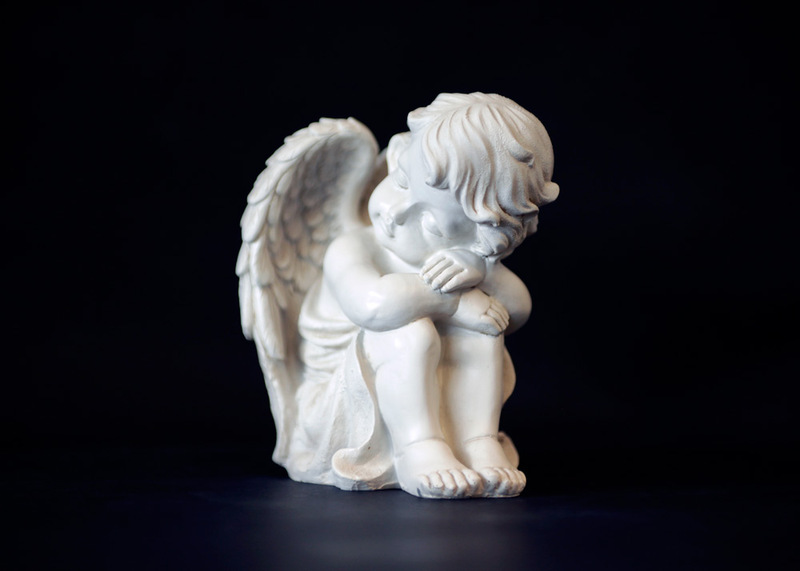 The slight slant given by changing the angle of view lends a relaxed feel, although it also can mislead the view into thinking the cherub is ‘falling’ off the image. 3/4 rear view. This view was taken from the opposite side as the first 3/4 rear view, the face is totally obstructed, and combined with the focus on the texture on the wings, this leads to a very open interpretation. 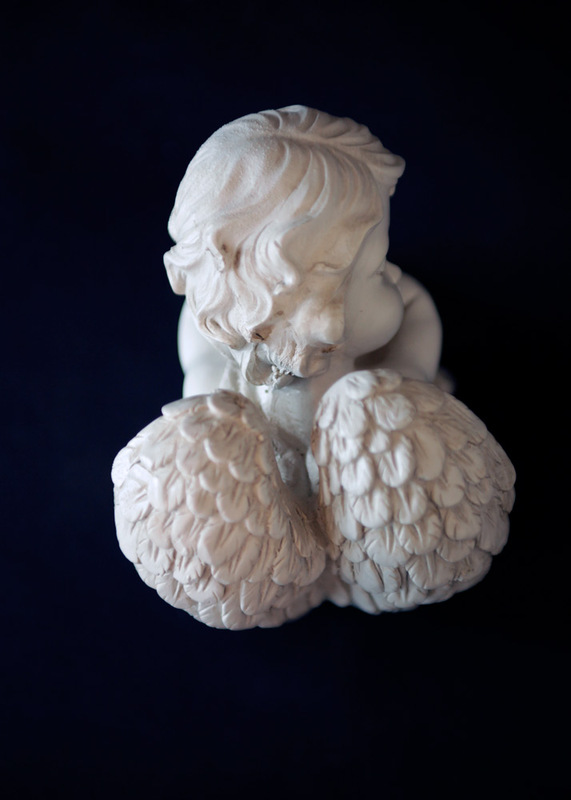 In this view, the focus shifts to the wings and the texture on them, and the expression on the cherub’s face is almost discernible. This leaves the mood of the image to be interpreted by the viewer. The sudden fall off of light on the shadow side adds to this openness. This entry was posted in Uncategorized and tagged Camera, Depth of field, Focus (optics), Graphics. Bookmark the permalink.